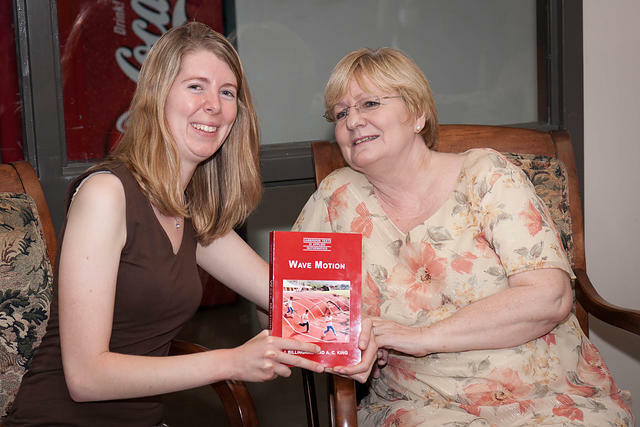 Betti Giles (right) with Jennifer Ribbeck, the 2010 recipient of the award. The Betti and Robert Giles Senior Mathematics Award is the Math Department's most prestigious award for undergraduate students. It carries a cash award plus a mathematics book selected by the student. It is presented each Spring to usually one, but sometimes two, outstanding seniors in Math. This award is given on the basis of overall GPA, performance in mathematics, and recommendations from mathematics faculty members. The award is funded by the Robert T. and Betti A. Giles Mathematics Education Fund (originally named the Mathematics Education Fund). This fund was started so that Robert and Betti Giles could honor their love of mathematics. It was also a way to help them get through their grief when Betti's brother, Michael Pharr, died. The Giles were also inspired by mathematician Paul Erdős who gave math awards around he country. With the Senior Math Award the Giles want to touch the lives of young people who love math.